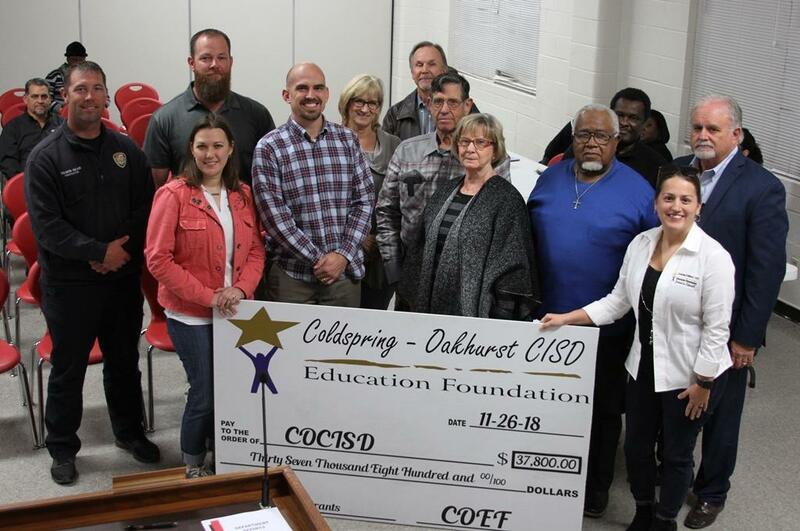 The Coldspring-Oakhurst CISD Education Foundation (COEF) awarded a total amount of $37,800 in grants to COCISD teachers and directors for its 2018-19 grant cycle. This is the 7th year the COEF has awarded grants since the group began in 2011. 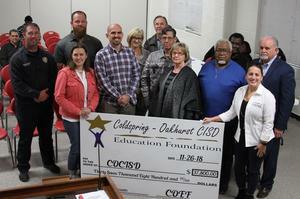 COEF directors presented a check to the COCISD Board of Trustees on Monday, Nov. 26th. This year’s awards will benefit COCISD students on every campus. The grants will provide new computers for Kindergarten, 1st, and 2nd grade classrooms at James Street Elementary; Coldspring Intermediate students will enjoy math and reading study aids; students at Lincoln Junior will receive flex seating for Science classes, and English and Social Studies small group materials; and Coldspring-Oakhurst High School is getting a cutting edge Z-Space program for science students, as well as additional science lab equipment, to name a few. A district-wide grant was also awarded to fund a program designed to improve parent-teacher communication. The COEF was formed by a group of caring and committed citizens with a vision to enhance the educational opportunities and student success at COCISD. They are a 501(c)3 philanthropic organization, governed by a volunteer board of directors composed of dedicated community members.